The Leather Hall of Fame recognizes people and organizations who have made significant contributions to the modern leather community over time and provides a historical and educational reference for the community. We represent all people in the modern leather community (1950 - present) around the World, without regard to gender or sexual orientation. Anyone can nominate a person or organization for the Leather Hall of Fame. The annual deadline for nominations is October 15th. The Leather Hall of Fame Board of Governors selects three nominees for induction each year. The 2019 inductees are the Leather Archives & Museum, Fakir Musafar and Samois. The induction ceremony is April 28, 2019 at the Westin Hotel, Cleveland, Ohio. Details at www.clawinfo.org. 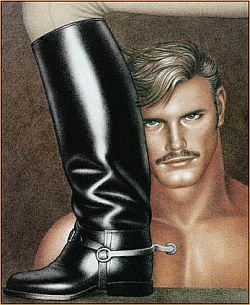 © Tom of Finland Foundation. All Rights Reserved. Used with permission.